With golf’s greatest team event on the horizon, in which the fortunate few test their talents and guts on an international stage for golf immortality–I’m talking about the Coyne Cup, of course–I visited with one of this year’s Ryder Cup captains, seeking counsel for my own upcoming captaincy of Team Coyne versus the coddled and overconfident side of Team Paddy the Caddy. Actually, I was recently offered the chance to travel to a lap of extraordinary golf luxury at the Abaco Club in the Bahamas to play in the Darren Clarke Invitational, where by some miracle I was partnered with his 17-year-old son, Tyrone (named after Clarke’s county of birth), who turned out to be a thoughtful and un-spoiled model of youthful class, and who was really good at golf, too. We won the tournament, and I won some time to speak with Clarke at his beloved second home at Abaco. The place is unlike any I’ve visited in golf; not so much a resort as a golf club where the people all happen to live there a few weeks a year, Abaco (run by the same hospitality masters behind one of my Scottish faves, Machrihanish Dunes) was the golf getaway I would design if people asked me to do such things. Golf course with a world-class practice facility, two restaurants where no reservations or jackets are required, a resident Open champion sipping sea breezes at the beach-side watering hole, and everything within a short drive of your golf cart, a community of old friends in golf shirts hanging around a white sand beach and a thatched tiki bar overlooking bright blue waters. You could lounge on the beach, tee off, have conch for lunch, or sip an expertly poured Abaco Smile within forty paces. No driving, no worrying, no need to be anywhere than where you were–and as for the course itself, I had heard it described as a tropical links, and sort of chuckled. I wasn’t laughing when the wind nearly knocked us off the first tee, a breeze imported from the Highlands. Designed by links gurus Donald Steel and Tom Mackenzie, the place played links firm with a rollercoaster links topography, holes that twisted and turned and climbed and dropped–I had never played warm waterside golf like it, and couldn’t help but find it perfect for combining my two favorite ways to golf: On a links, and in shorts. I sat down with Captain Darren Clarke and rather than grill him on his picks for Team Europe, I thought I would get to know the man, understand his likes and dislikes, get a feeling for the fiber that constituted a big-stage Captain. So we talked about fish. Abaco was a world-class fishing destination as well, and fish was all any one was talking to Clarke about, it seemed, as he is a dedicated saltwater fly fisherman and had recently achieved a lifetime feat that he didn’t rank far below his Claret Jug: After stalking it for years, Clarke had finally caught the black-tailed devil. T: How did it happen? How did you finally catch the prized permit fish? D: It took the fly for a change. T: Fair enough. But why is it such a special fish? D: Because they are the most elusive fish in the world to catch on a fly. They are the hardest fish to land. You can go different places around the world and catch smaller permit but the big ones get big for a reason. They’re very wise. Bonefish would be the most prominent saltwater fly fishing species that people would chase after. Bonefish, whilst they’re difficult to catch, you can catch them. Tarpon as well, whilst they’re difficult, you can catch a lot of tarpon. Permit, there’s not that many of. They’re very clever. They look as if they’re going to eat all the time then they never do. And you can stand on the front of the bow of the boat for three straight days for eight, nine hours a day, and not throw one fly. Just not find any fish. So it’s a completely different level of dedication in terms of fishing. It’s way out there. You gotta have something wrong with you to actually do it. T: Was it just the right day? The right conditions? D: Yeah it was the right day and right conditions and I got one of them to actually eat for a change. And the ultimate to do in salt water fly fishing is to get the Slam. The Slam is a bonefish, a tarpon, and a permit. That’s the ultimate. In the same day. T: Did you get the slam that day? D: No, I didn’t go after them that day. I just went after more permit. You use different rods for each fish. So now I have each of the rods on the boat every time I go out, just in case I catch a permit early, then I’m off to the other ones. T: Where did you fall in love with fly fishing? Was it in Ireland? 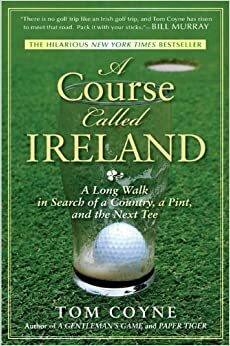 D: It was many years ago, a good friend of Chubby’s [Clarke’s longtime manager, who during this interview was sitting next to Clarke and thumbing through the copy of A Course Called Ireland I brought for him–always be promoting], a guy called Stephen Boler, rest his soul, used to pick us up after we’d play the Open. So, Lee Westwood, Chubby, and myself, he would pick us up in his jet and we’d fly off of Scotland and we’d fly up to Inverness. We’d take a helicopter from Inverness into an estate that he would rent on the Helmsdale and we’d fish for salmon. We’d fish for salmon early in the morning. We’d come home and have breakfast then would take off in the helicopter and go and play Nairn, Skibo, Royal Dornoch, Brora up there. Then we would go back to the house, then we’d probably have a bit of tennis in which Chubby’s racket would always seem to have the holes in it, and then we’d go back in the river for salmon again. T: That’s a good trip. D: We’d do that for four days every year right after the Open, and that’s where it all started. And then when we’d come down here [to Abaco]–Chubby was the first to come out here in 2003. Chubby was a member, then I was a member, Lee Westwood was a member. As soon as I came out here, I started them with saltwater fly fishing, and it’s a whole different level of salt water fly fishing here, totally different. And from there I was completely obsessed. T: That’s excellent. I feel like I need to ask you a golf question. D: Not really. (Laughs) Golf gets in the way of my fishing. T: Who do you think will win the Coyne Cup? T: Or, do you happen to know the secret to golf? I searched Scotland for it last summer and found it; I was wondering if you knew what it was, too. D: The secret to golf? D: No. I wish I did. D: The secret to golf is to play tennis. Vegas has the Euros pegged as underdogs in the Ryder Cup, but with his mind set on it, can the catcher of the Black-Tailed Devil possibly lose? And how can I root against him? This year, fate has put me in the path of not just Euro Captain Clarke, but Euro Vice-Captain Paul Lawrie, my playing partner in the Irish Open Pro-am. Both are joyful, generous gentlemen. How do I not pull for my almost-friends? I know, I know…sea to shining sea… But Davis Love doesn’t hang out with me and tell jokes to my wife. I’ll side with the fates. Come on, Euros!